I am right now in the middle of an Inception. 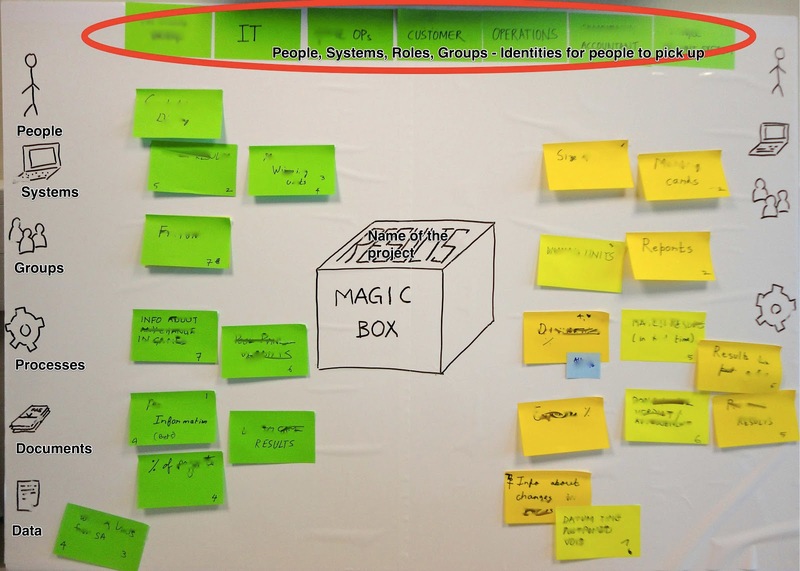 (If you are hearing this term for the first time, in simple terms it is the phase of initiation of an agile project.) A time when you are trying to get your head around a business problem. Understanding a new domain and your immediate scope of work. We usually take the help of a number of interactive exercises to get the stakeholders up and talking about their work. Most of the times we have to tweak our repertoire to adapt to the customer domain and participants in the workshop. This time we came up with a new exercise, which we named as 'Open the Magic Box'. Our customer is a 90 year old business, undergoing a transformation to keep in pace with the changing times. A new adopter of agile but very keen to learn and adapt. The participants for the inception brought with them a rich repository of domain knowledge. Thorough with the process which they ran (some of them over 40 yrs in the business) but completely new to application development. Most had never been asked what they wanted. A new application would emerge and pushed on them to learn and use. In the first few sessions we had got a hang of the overall flow and it was apparent that there were multiple siloed applications which the group used while we were aiming at achieving a end-to-end process view cutting across functions. without getting bogged down the intricacies of the thousand things that happen in between. The magic box is the central object around which the game is organized. Use either a physical box if you are doing it on a table or draw on if you intend to use the wall. 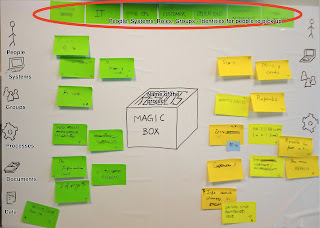 Part 1: Ask people to consider that the magic box is going to give them all that they need. But in order to open it they have to say a magic phrase. When or how often does you need it? Part 2: Ask them to consider that they have to put something in the box to come out with the outcome. Do a quick check and match the outputs to the inputs. Ask the group if they see all the inputs are placed on the left to get a desired output that they stated earlier. There may be multiple inputs resulting in an output. Take one output at a time and number it. Mark the inputs with the corresponding number. By the end of this exercise you should have identified the most important actors that interact with it and in the way they interact. The outputs give a good idea of the end objectives that is desired from the system. This was the first time we played this game and results were satisfactory. The first person took some prodding but others soon picked up the magic phrase structure. A quick retro after the exercise brought out the fact that it is important to stick to the structure and the metaphor. It helps people to think differently and give the desired output. Nice panda. Looking forward to discussing this in more details once u r back.